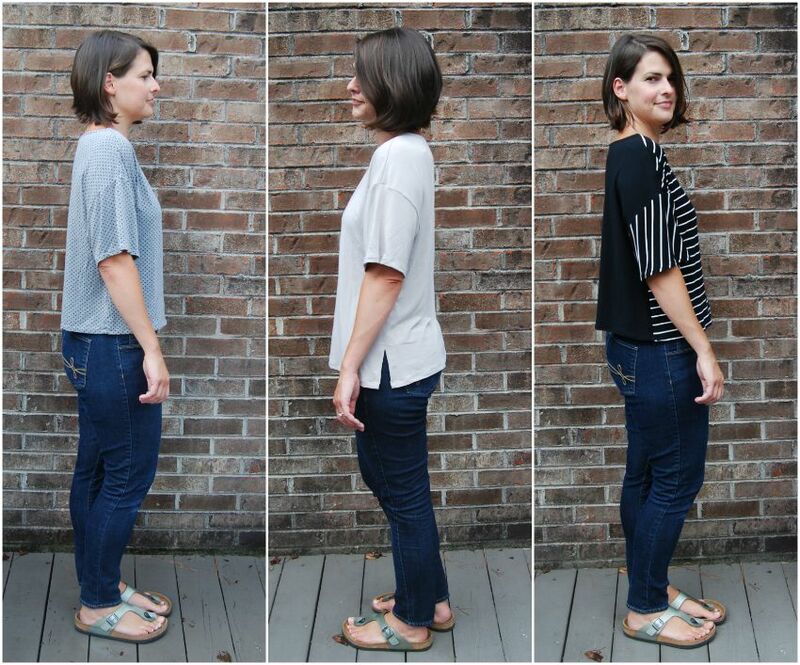 I made a few slouchy tee shirts using Very Easy Vogue 8984. And I will venture to say that it probably has one of the least enticing cover illustrations ever. Honestly, I am not even sure why I own this pattern. I think I bought it a while back for some sort of franken-pattern project. Sometimes I buy a pattern just for the sleeves or neckline or something. Anyway, I think we can all agree that the cover is pretty bad. I made up the grey polka dot version first. Actually, I made it back in May and wasn't in love with it at first. But I ended up wearing it so often that it grew on me. I used a soft bamboo knit with printed dots that I love. It's nice stuff. I made the greige version next, lengthening the pattern almost six inches and adding side splits. It's also a bamboo knit. The striped version was made by recycling a skirt I made recently and never wore. I made that knit skirt in the spring and thought I'd wear it a lot when it got warm. But the length was weird and I never got over the mismatched stripes. So I cut the front and sleeves of this tee from it. I didn't have enough to cut the back without a seam and no stripe matching. So I made the back in a solid black. Again, all bamboo knits. Sensing a theme? I bought a bunch a while back and I don't know if I can ever go back to buying cheap knits. I bought all of these lengths from fabric.com and they are great. Stretchy and beefy with nice drape. My only complaint is that they are a little heavy. I can see how a light weight rayon knit might be more appropriate in some circumstances. I'll be curious to see how all my tees wear over time, though. Pattern Description: Vogue 8984. Semi fitted pullover top has dropped shoulders and narrow hem. There is a longer sleeve option and a cropped hem option. Pattern Sizing: I cut a 12. I went down a size from my usual 14. Fabric Used: All bamboo knits from fabric.com. 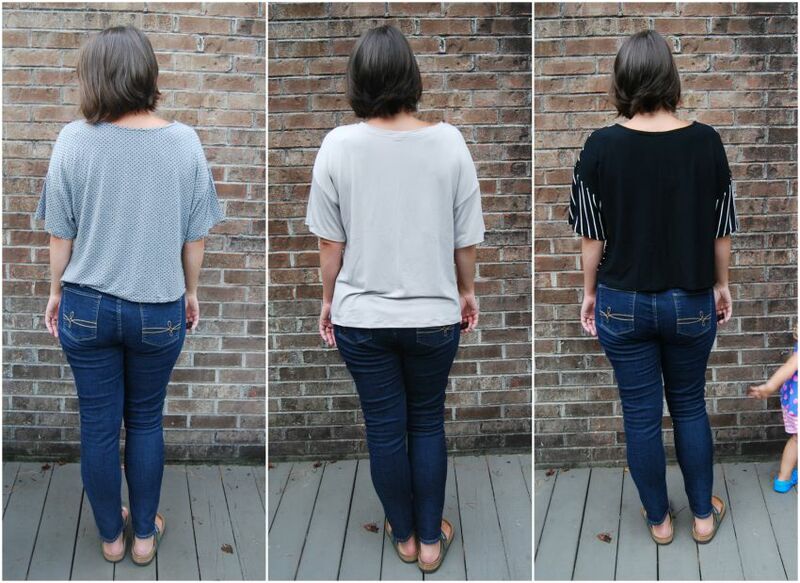 Alterations/Deviations: The grey version I made first is view B, the shorter sleeve and longer length plus one inch. This tee is short. I would call it cropped but I do have a longer torso. The greige version is view B plus 6 inches added to length with side splits. The black and white striped version is view B length as is. I would have made it longer but the pattern pieces just fit on the piece of fabric I recycled. I did the necklines on all three shirts differently. The first grey version was done as the pattern instructed- folding under and stitching. I really dislike that finish but I did it anyway. I sandwiched some steam-a-seam in before I stitched. That is the first time I've used it on a neckline. I also used steam-a-seam on the hem of the grey version. I do not like the way the steam-a-seam made the hems and neckline kind of... crunchy, I guess. I didn't use any sort of stabilizer on the other versions and my hems are just fine. I guess these bamboo knits are beefy enough that they don't really need it. I did a neck band on the greige version, which turned out decent. It's a little wavy. And on the black and white version, I made a binding that I flipped to the inside and stitched like a bias facing. I think that finish worked the best. 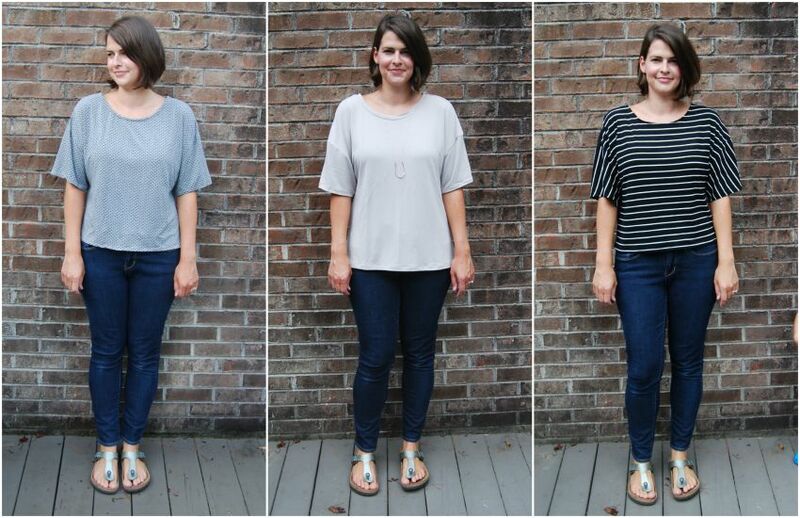 Likes/Dislikes: I love a good, slouchy tee and this pattern fit the bill. But yes, it is a strange pattern. I like the depth and width of the neckline, too. And the dropped shoulder is kind of trendy right now. But a flattering tee, this is not. All three will get lots of wear. I actually made one more version in solid black and cropped it super short to wear with skirts that sit at my natural waist. A little longer at the back. And I really dislike it for some reason. Especially after taking some photos of it with different things. I'm only including a photo for informational purposes. Something about the proportions are way off and I really don't like the way it looks. I'm going to hang on to it for now. Maybe I'll try shortening the sleeves to see if that helps. And I'll blog about those culottes (with the mismatched stripe) one day! I love them and wear them all the time. Conclusion: Phew! I sure did just write a lot about this simple, little pattern. I intended this to be a fast and furious blog post. It was an easy, quick sew. Almost all straight seams. I recommend the pattern if this is a style you are looking for. Look past that terrible cover art! Well hello there! I did not intend on being away from this space so much this summer. In fact, summertime is when I usually blog more often, being a teacher and all. But life happens. Of course. I mentioned this on Instagram, but our washing machine flooded our house about four weeks in to summer and ruined all of our hardwoods. So the entire second half of my summer was dedicated to moving out, getting new floors installed and then moving back in. Not that much fun! Now that we are back in, though, I am really enjoying our new floors. They are absolutely beautiful. And we got a new washer and dryer. It's nice. Can't complain about that. My take away from all of this is to never ever start a load of laundry without watching that it stops filling before walking away and doing something else. That's my PSA to you, too. Anyway, I did do a fair bit of sewing this summer. Most of it was pre-flood, though I squeezed some in during the moving part as well. I collected almost everything I made this summer together the other day and took a bajillion pictures so I could write a few blog posts. You may see me in these same rainy photos for a while. I made this top early on in the summer so I will write about it as best I can remember. This is the Branson top, an indie pattern by Debbie Iles of Lily Sage & Co. I don't buy a lot of indie patterns (I'm cheap) even though I love a lot of designs I see. But I did splurge on this one. There are so many things I like about the design. The cut on sleeve, the seam at the back, and of course, the bow. I'm also a lover of linen, so Debbie's versions swayed me as well. So here goes a review. 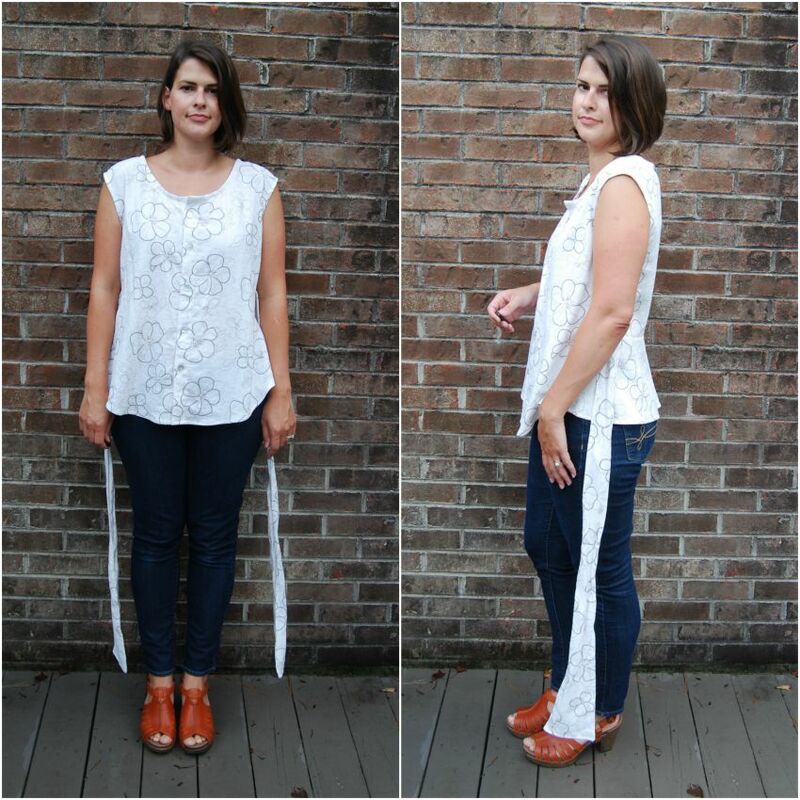 Pattern Description: Branson is a buttoned blouse with two sleeve options- a sleeveless version that ends up having a little cut on sleeve and a long sleeve version. I made the sleeveless version. 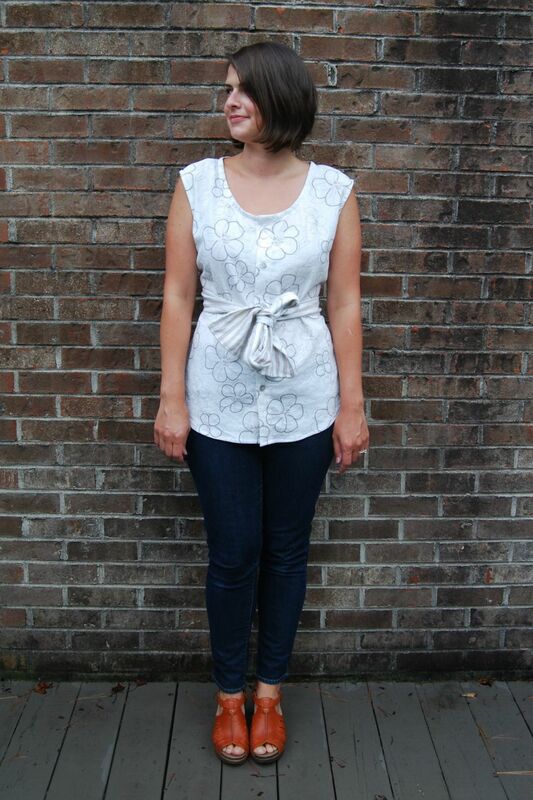 The front of the top is loose and has a waist tie that you tie in to a great big ol' bow. Below is a photo of top untied so you can see the shape better. 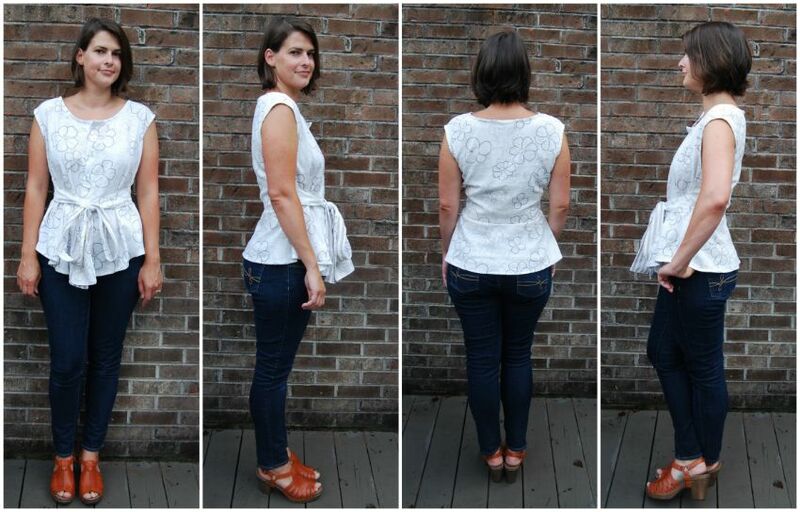 The back is more fitted with a little peplum. Pattern Sizing: Debbie has her own sizing chart. I made a size 16 even though my bust measurement puts me at a 14. Debbie included a different front pattern piece with an FBA for larger cup sizes. I think I remember reading that it was for a C cup and up. I am a B cup, sometimes a C cup. I'm kind of in between. So I decided to size up and use the smaller cup size piece. My waist and hip measurement put me at a size 16. Fabric Used: I used a printed linen/rayon blend I found at Joann's. I changed up the waist tie to have a front and a facing so I could use a woven striped linen I had in stash to coordinate with the print. I also bound the neck edge with the striped linen, which did not turn out well. 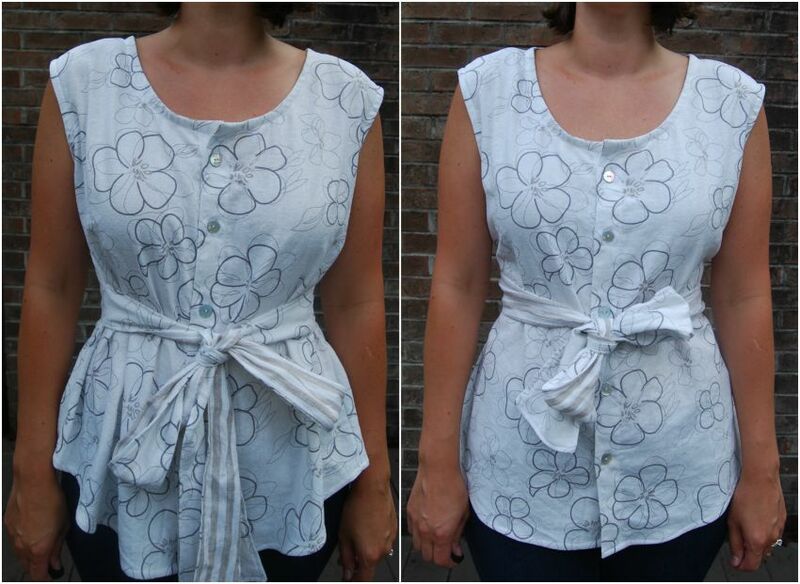 Alterations/Deviations: I did make a couple of changes to the waist tie. Like I said above, I cut the waist tie in to a front and a facing to use the two different fabrics. I also lengthened and widened the waist tie. After looking at some of the tester versions, I thought I wanted a bigger, more obnoxious bow. And I'm very happy I did lengthen it. Not because I liked the bigger bow, but because I can now wrap the tie around my waist instead of just tying it in the front. When I wear it tied in the front, it droops while wearing. When I wrap it around the back first and then tie in front, it stays in place better. That's nit-picky, I know. But I prefer it wrapped all the way around. In the photo below, it is tied only in front in the photo on the left and wrapped all the way around on the right. I also think the bust looks better when it's wrapped around. I do have some wrinkles at the back but I can't tell if that's because I need to alter fit or if it's just the waist tie pulling at the side seams. Likes/Dislikes: I like the shape of this top very much. Love the cut on sleeve. 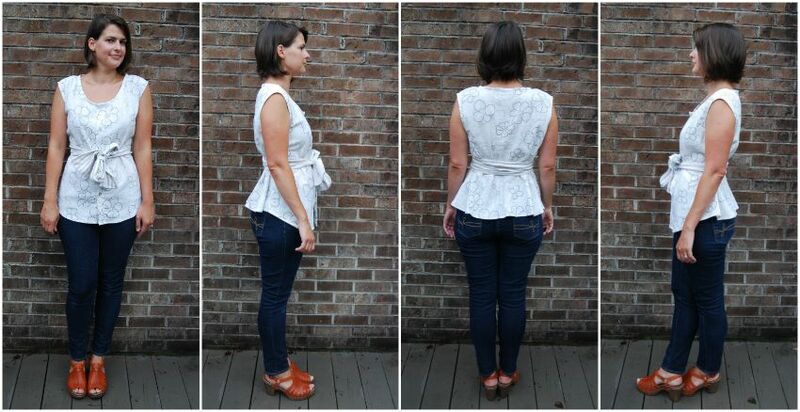 Love the back peplum. I royally screwed up binding the neckline. I didn't trim corners as the pattern instructed and it shows. Also, the woven linen is much more wiry than the rayon blend I used and that makes the binding stiffer than the rest of the top. It's kind of a mess. I've only worn this once because the neck binding bothers me so much when I wear it. I also did not take any pattern placement in to account and ended up with two big flowers at the top front. Probably only noticeable to someone who sews. I do love the shape of the neckline. The back neckline is very straight and I was surprised that it fit so well with no changes. I am always fiddling with back necklines to get a good fit. I may use this one for comparisons in the future. Conclusion: Nice and easy, but unusual pattern. I'd love the make it again with a few tweaks. I'd definitely watch that neckline binding and trim properly if I made it again. And I'm kind of intrigued by the funky long sleeved version. We shall see!